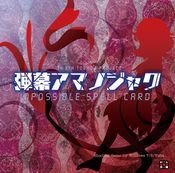 Danmaku Amanojaku ~ Impossible Spell Card () (弾幕アマノジャク　～ Impossible Spell Card) is a danmaku game and the 14.3rd official installment of the Touhou Project, featuring Seija Kijin as the main protagonist. The game was released at Reitaisai 11. As the title implies, it is a spinoff game consisting mostly of (near-)impossible-to-beat spell cards. The player controls Seija Kijin, who uses a total of nine different "cheat" items to survive and clear spell cards. Before each card, Seija is equipped with a main item and possibly also a sub-item. The main item grants an activated ability with a limited number of uses while the sub-item grants a passive effect. Main Ability: allows Seija to teleport in front of the boss, but the X button can be held to adjust the position. Passive Ability: making her hitbox smaller. Main Ability: allows her to clear bullets using photographs. Passive Ability: increases her movement speed. Main Ability: allows her to teleport to the other side of the screen (vertical and horizontal); and holding the button will keep Seija hidden for a short period of time on the side she had teleported to. Passive Ability: it allows 3 uses of itself (this takes priority over the main-item if pressing against the wall, but if it is used as both main and sub-item, the main will be used first), but you are not able to hide yourself when teleported. Main Ability: allows her to swipe the space in front of her, dealing damage to the boss if she is close enough. Passive Ability: increases the amount of times the main-item can be used, or in the case of the Tengu's Toy Camera, Four-Foot Magic Bomb, and Ghastly Send-Off Lantern, it increases their proficiency. Main Ability: allows her to survive one hit. Passive Ability: it allows 1 use of itself but the invincibility time after being hit is shortened. Main Ability: allows her to lead aimed bullets away, meaning that every bullet nomally homing onto Seija will be aimed at the Doll. Passive Ability: increases the bullet shot spread, covering a wider area. Main Ability: upon pressing X, the bomb will begin charging. After a few seconds, it will explode, clearing all the bullets around it. Passive Ability: whenever Seija uses any of the main-items, bullets around her are erased by a explosion. Main Ability: allows her to become invincible for a limited amount of time. She can move around and shoot freely. Passive Ability: allows item use in the same way as counter-bombing. Main Ability: allows her to hide in the fabric, thus becoming invincible for a short amount of time, during which she can't move nor shoot. Passive Ability: it allows 2 uses of itself, but only when the main-item is unusable. This is the first official Touhou Project game that does not bear the kanji Touhou (東方) in its title (but not the first work overall as most CD titles also don't use the kanji). The Japanese part of the title starts with "danmaku" (弾幕), referring to the main theme or genre of the game, while Amanojaku (アマノジャク) refers to the playable character's species: Seija Kijin. The term "Impossible Spell Card" is describing what the game is about: dodging danmaku that's considered impossible, but are actually possible since there's a trophy that can be achieved if clearing all spell cards without "cheating". Following the events of Double Dealing Character, Seija Kijin has become a wanted amanojaku in Gensokyo. There has been signs saying that whoever captures her wins a reward. Since Seija has become a rebel, youkai have decided to use spell cards that's considered impossible to dodge, but Seija is determined to not give up and decides to cheat using the said items. Later on however, the tengu have taken notice and have written up a newspaper about her mischief, which causes stronger youkai and humans to try and capture her. Shinmyoumaru Sukuna confronts Seija and declares that she ought to return the remainder of the Mallet's magic and that they've lost the war that occurred during Double Dealing Character. Seija, believing that using her cheating magic to conquer Gensokyo, Shinmyoumaru states that they ought to surrender because she has had enough. Since Seija goes against her will, Shinmyoumaru goes against Seija and gets others to capture her. In the end, it's revealed that Seija has lost all of her allies, but it's nothing to worry about because the amanojaku can never really make friends anyway. In the mini game Gold Rush that ZUN created for the Digital Game Expo, the story continues, albeit non-canonically. Somehow acquiring the ultimate rule-breaking item, the Miracle Mallet (Real), Seija sets about robbing the Hakurei Shrine of its assets before the Miracle Mallet's power runs out. The soundtrack of Impossible Spell Card features a total of nine tracks. Four of these were directly taken from previous games, all used during dialogue within a spell card. The other themes, aside from the title screen, play during any other spell card. The title screen, like any other, uses the motif from "Theme of Eastern Story", from the CD Akyu's Untouched Score vol.5. The game was announced by ZUN on April 12th, 2014, near the end of the internet broadcast "Chotto Summit ~ The Drinking Party of Indie Game Developers", showcasing the promotional video later uploaded at Youtube. A few weeks before the release, ZUN posted some info about the game and it's release on his blog. The full game was later released at Reitaisai 11 on May 11, 2014. On November 16, 2014, ZUN released a mini game called Danmaku Amanojaku Gold Rush at Digital Game Expo 2014's "Doujin Shooting Game Caravan" contest, where it was available to be played. It's an extension to Impossible Spell Card, but it's yet to be released to the public. Visit the thpatch game page to find the specific patch contents for Impossible Spell Card.